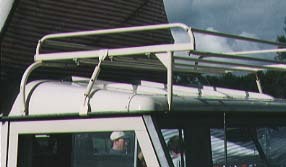 The two racks I have shown above are the original Dormobile racks. They only differ in the accessories added AND by the clamps that hold them to the vehicle. I hope to show photos of non original racks as I get them. 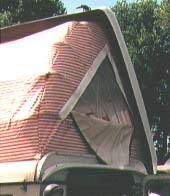 This photo shows the front of Loren and Linda Stelzenmueller's Dormie. It has Gerry cans mounted on the bumper which would obscure the lights and turn siganls. The solution? Lights and turn signals on the wing. 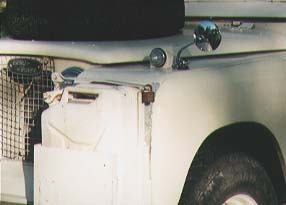 This photo shows the small light found on the side of some Dormobiles. I don't believe it has a separate switch, I think it is on when the vehicle lights are on. I'll double check that. 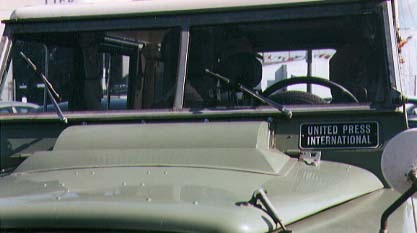 This photo shows the optional fly screen installed over one of the rear windows. A great idea for warm areas with bugs but Eric Mills reports that the screens whistle when driving. I can report that an empty Dormobile rack also howls at speeds around 55 mph. Below is a scan of a Lucas parts book, dated 1967. 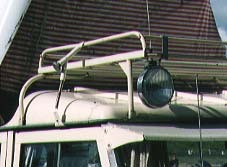 It shows the Roadlamp and foglamp that are listed in the Martin Walter options list I have. Road Lamp, Lucas 6LR Ranger and Foglamp, Lucas 6 FT Ranger. 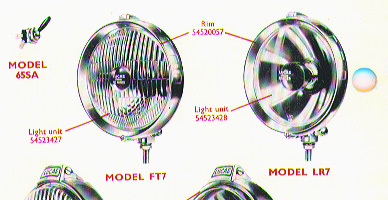 Unfortunately, the Lucas lamps with the number 6 in the description are called Pathfinder, and the lamps that are called Ranger have the number 7 in the description. Go figure. This is NOT an original Dormobile feature. It is found on the "Canadian" Dormobile of Nick Baggarly. However, it is ingenious and Nick reports that it does aid in ventilation. Mosquito netting is sewn in to keep bugs out, thus, I think this owner installed modification is very good. 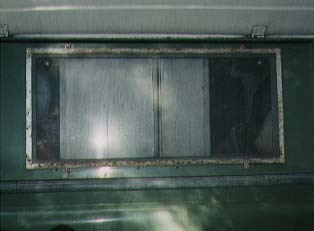 Here is an airconditioning bulge on a factory installed airconditioning unit on the Mill's Dormobile.